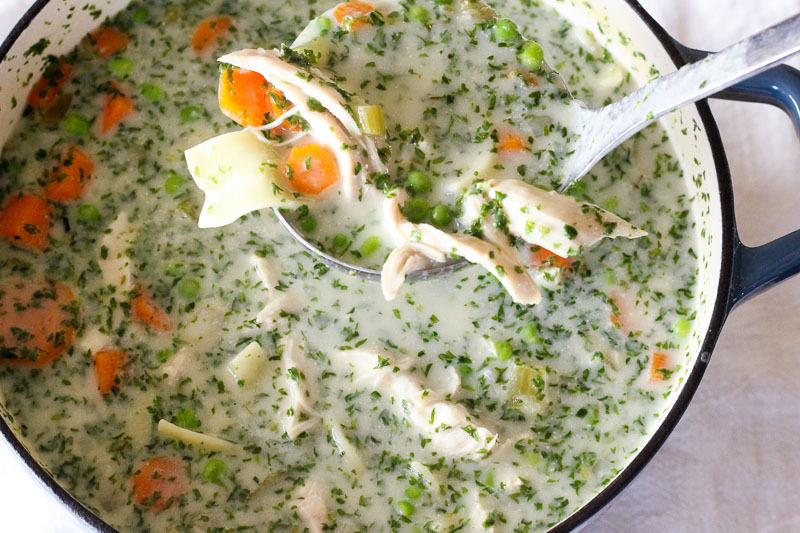 This Creamy Chicken Soup With Egg Noodles is the chicken soup dreams are made of. 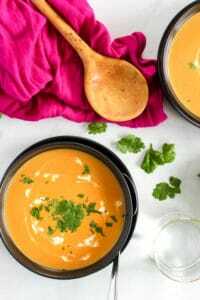 It’s hearty, healthy, both fresh and creamy, and easy to make. Give it a try… it’ll be love at first bite. YUM. Yum yum yum yum yum. This is a simple soup. 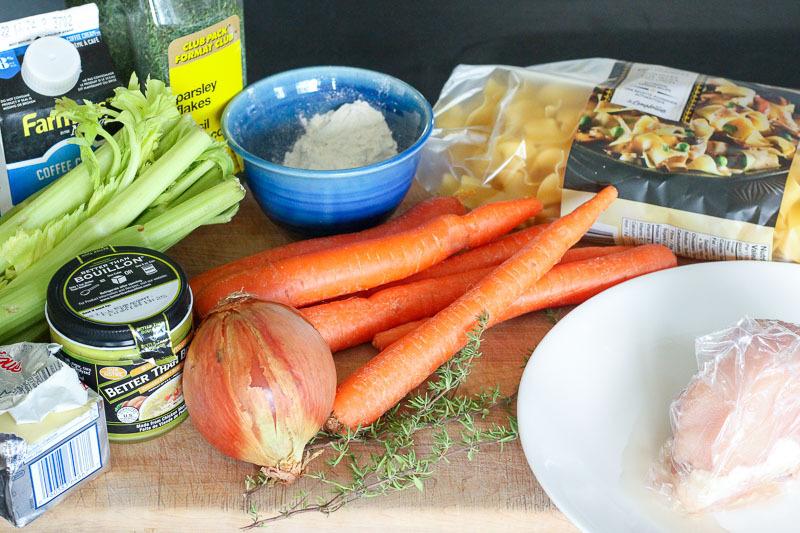 It’s easy to make and the basic ingredients are what you’d expect in a chicken soup – chicken, carrots, celery, onions, broth. 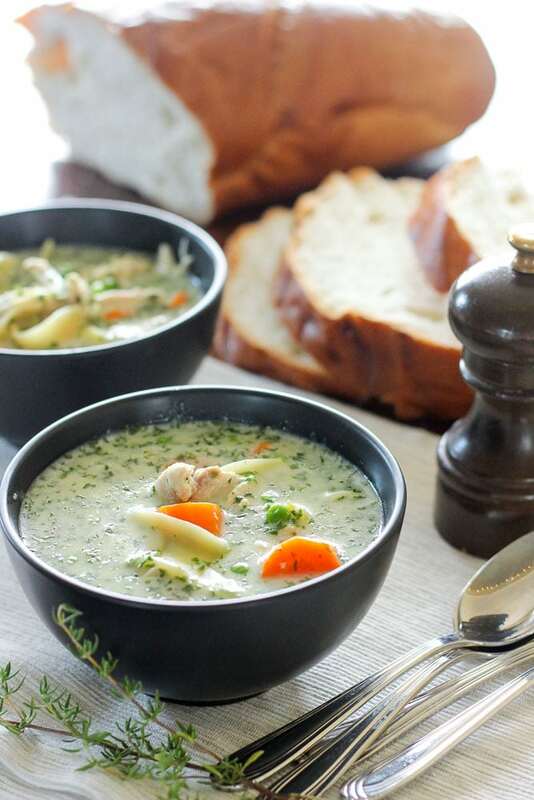 And while I like a regular chicken soup just fine, it doesn’t really conjure up the the overwhelming ILOVEYOU feelings that this creamy chicken soup does. The cream, the parsley, the hint of thyme in the background. Yes, iloveyou creamy chicken soup. 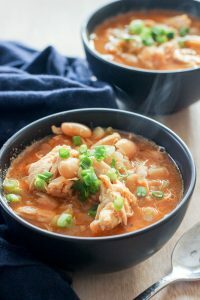 As an added bonus to how delicious this soup is, it’s also pretty cheap to make. Some root veggies (onions, carrots), some celery, frozen peas, ONE chicken breast (which I think is pretty reasonable for a whole pot of soup! ), a few herbs and a bit of cream (whatever kind you have on hand should work, in a pinch). 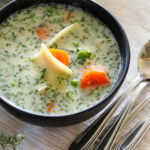 Make sure you don’t skip the salt, because in a soup this fresh and creamy, you’ll need it to bring out the flavours (see my previous salt-centric rant here). That’s it! 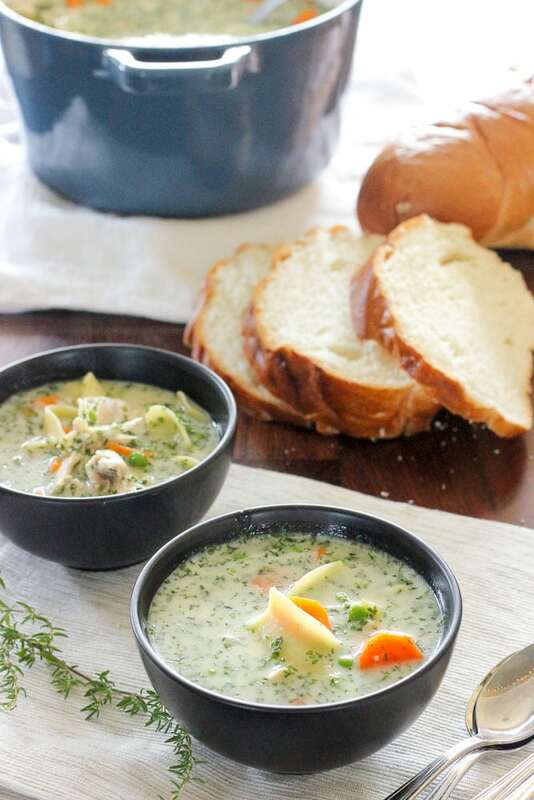 You can throw this soup together with a few staples from your freezer, pantry and fridge. And you absolutely should. Because YUM. Don’t miss the step-by-step photo instructions below the recipe! Chop 1 onion and 4 stalks of celery. Chop up 1 teaspoon of fresh thyme (or you can use 1/2 teaspoon of dried thyme, but it’s not quite as good). 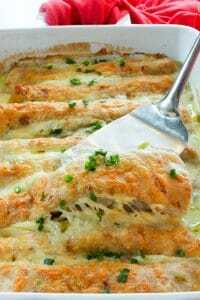 Melt 2 tablespoons of butter in a large pot and sautee the onion, celery and thyme in the butter until they start to soften. Slowly add 1/4 cup of flour, stirring well to make sure it doesn’t clump up. Stir and cook for about 1 minute. 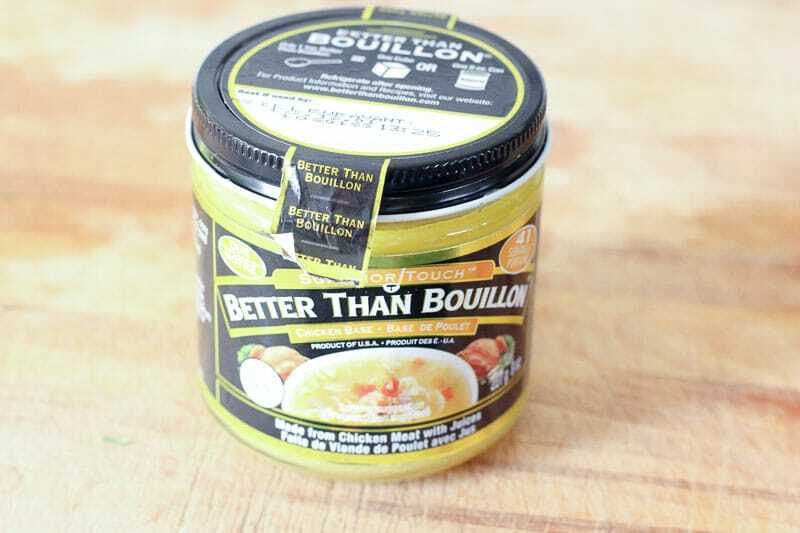 If you’re using Better Than Bouillon (which I love and recommend as a fridge staple), prep 6 cups of it with hot water. Otherwise you’ll need 6 cups of broth. Slowly start to add a bit of broth to the flour and veggies mixture. Use the broth to scrape the browned bits off the bottom of the pot. Add a few tablespoons and stir well, making sure no clumps are left before you add a few more tablespoons. Continue slowly adding the broth and stirring it into a smooth consistency until you’ve added it all. Eventually your pot will look like this. Add 1/2 teaspoon of salt and 1/4 teaspoon of pepper. 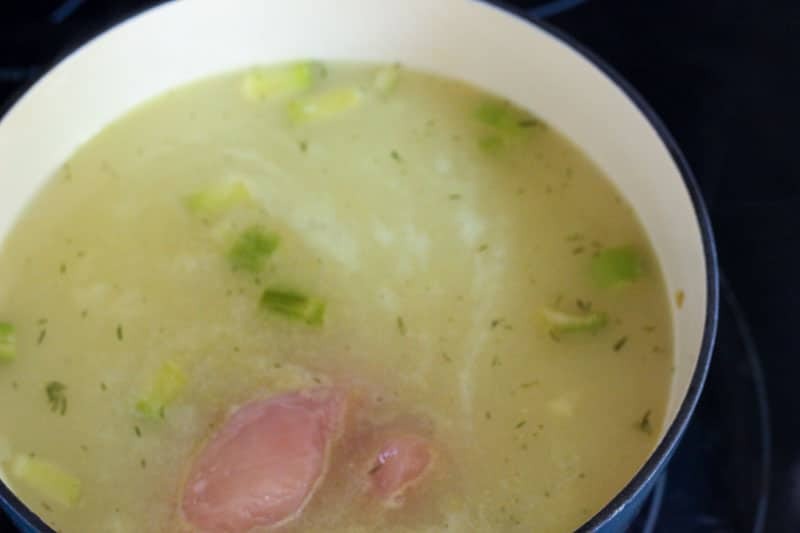 Nestle your chicken breast into the liquid, cover with the pot lid and bring the soup to a boil. Reduce heat to a simmer and cook for 10 minutes. Add 6 peeled and chopped carrots and cook for 5 more minutes. Then add 1 – 2 cups of egg noodles (depending on how hearty you want the soup to be). Cook for 7 more minutes. Add 1 cup of chopped fresh parsley (or 1/2 cup dry parsley). Fresh is definitely tastier, but sometimes all you can get your hands on is dried. Add cream. If I’m using a really heavy cream like whipping cream I might just use 1/2 cup, but if I’m using a lighter cream like coffee cream (shown in pictures) I like to use 1 cup to reach the creamy consistency I like). 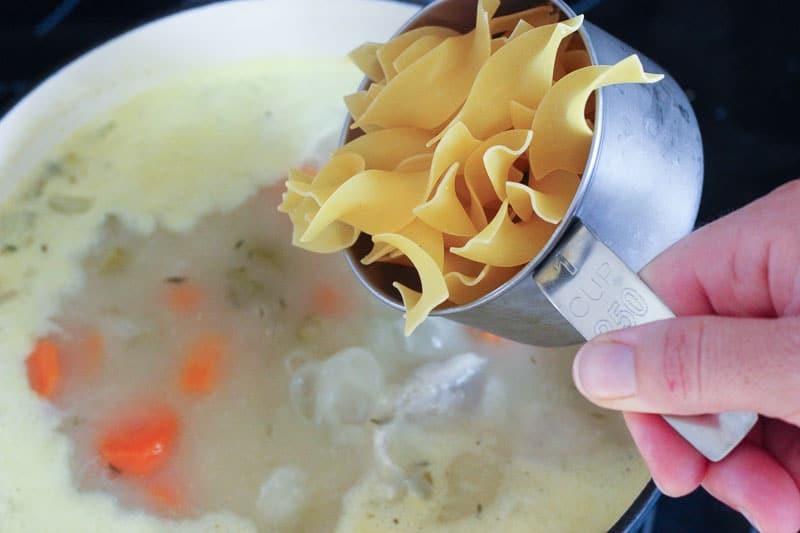 This Creamy Chicken Soup With Egg Noodles is the chicken soup dreams are made of. It's hearty, healthy, both fresh and creamy, and easy to make. Give it a try... it'll be love at first bite. 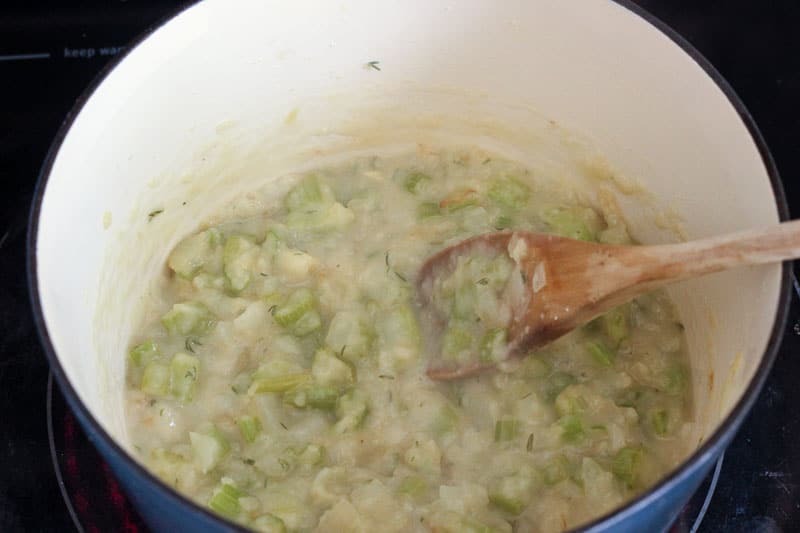 Chop onion and celery. Chop up fresh thyme. 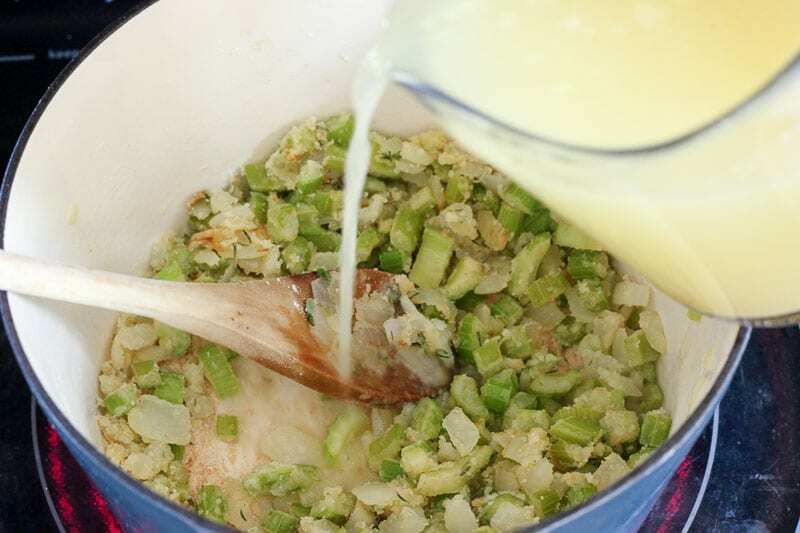 Melt butter in a large pot and sautee the onion, celery and thyme in the butter until they start to soften. 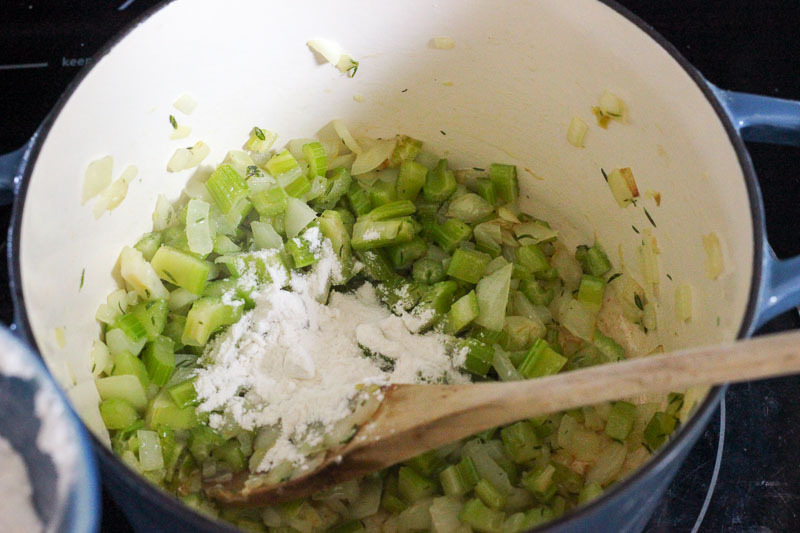 Slowly add flour, a few tablespoons at a time, stirring well to make sure it doesn't clump up. Stir and cook for about 1 minute. Prep Better Than Bouillon or broth of your choice. Slowly start to add a bit of broth to the flour and veggies mixture. Use the broth to scrape the browned bits off the bottom of the pot. Add a few tablespoons and stir well, making sure no clumps are left before you add a few more tablespoons. Continue slowly adding the broth and stirring it into a smooth consistency until you've added it all. Add salt and pepper. 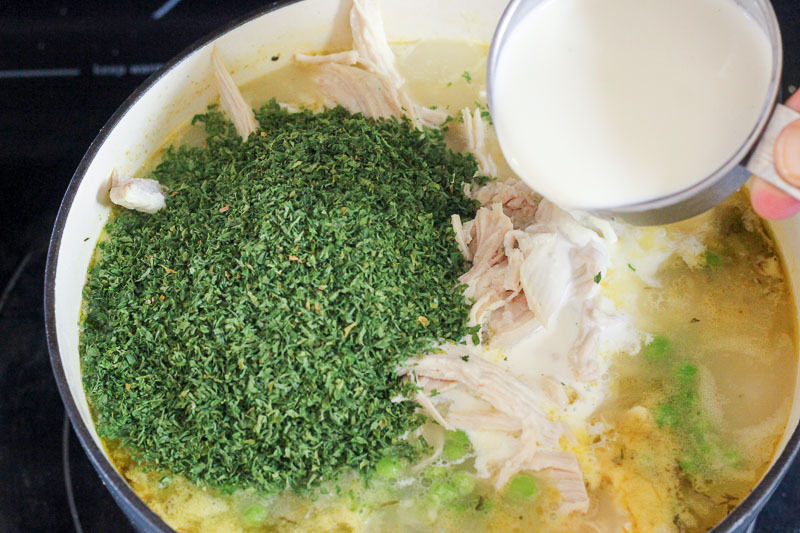 Nestle your chicken breast into the liquid, cover with the pot lid and bring the soup to a boil. Reduce heat to a simmer and cook for 10 minutes. Add carrots and cook for 5 more minutes. Then add egg noodles. Cook for 7 more minutes. Take out your chicken breast and put it on a big plate. 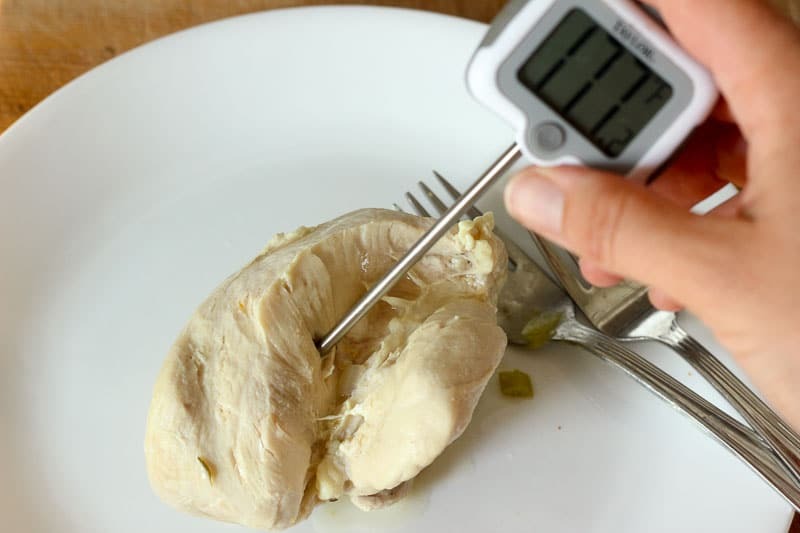 Test the temperature if you want** (I always do - it's the best way to know when meat is cooked!) - chicken should be 165 F - and use two forks to shred the chicken. Put chicken back in the pot with 1 cup of frozen peas. *If I'm using a really heavy cream like whipping cream I might just use 1/2 cup, but if I'm using a lighter cream like coffee cream (shown in pictures) I'll use 1 cup to reach the creamy consistency I like). 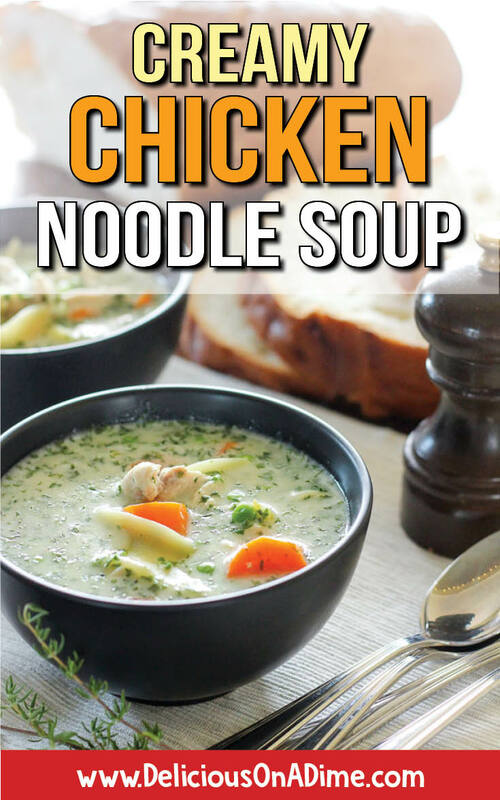 My new go-to recipe for chicken soup!!! It made 11-12 cups, so I guess each serving is almost 2 cups. I followed the recipe to a T (choosing 1/2 cup cream and fresh parsley) but used 4 carrots instead of 6 since I only had that many. I will absolutely make this soup again, and look forward or doing so. Thank you! Yay! I’m so glad you liked it! 🙂 It’s a regular in our house too. Thanks for the tips! Hi! We're Myra & Laurier. 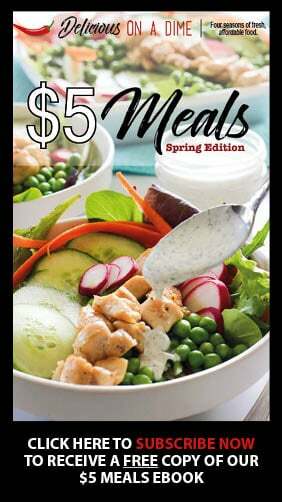 We want to help YOU eat delicious food, AND save money on groceries! 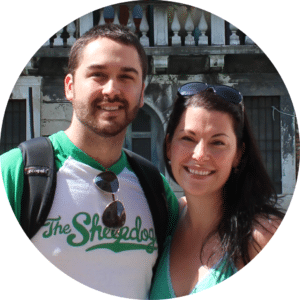 With years of experience, we bring you EASY and CHEAP recipes and tips. 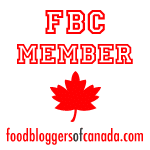 Take back control of your grocery budget, AND eat amazing food. 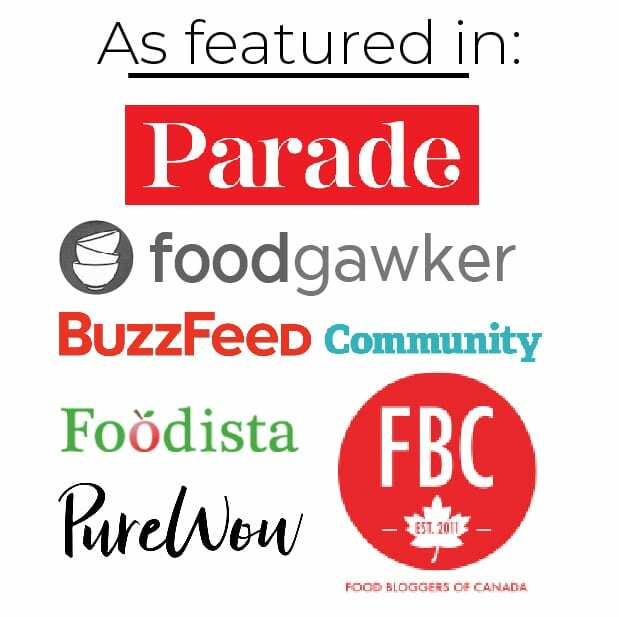 Creative Cooking Solutions is a participant in the Amazon.com.ca, Inc. Associates Program, an affiliate advertising program designed to provide a means for sites to earn advertising fees by advertising and linking to Amazon.ca. We are a participant in the Amazon Services LLC Associates Program, an affiliate advertising program designed to provide a means for us to earn fees by linking to Amazon.com and affiliated sites.